am i neglecting my blog? noooo-hoooo!! please bear with me. Bas had his exams this week. but thank Wotan, it is OVER! phew! what a stressful week was it. 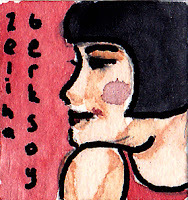 I managed to draw daily in my diary tho and i had a bit of catching up to do on mail art :x i love making and sharing mailart, however lately i have been slacking. hopefully my mailart friends will forgive me! and meantime i have just finished mailart for a tiny mailart exchange! :) it was FUUNN!! you had to make tiny artworks for this exchange, 1 inch squares or cubes :) well here is a peek to what i did ;p i illustrated some famous turkish women artists. here is one for you, at the end of the blog. 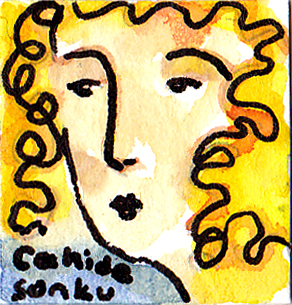 cahide sonku, a turkish actress and first female film director in turkey. My book arrived! Yay! Unfortunately this is only the second part of the diaries (of Alya Rachmanova), the part about her marriage in Russia, ending with her exile. Anyways, i am looking forward to reading this interesting diary I came across in such an adventurous way :) It is a lovely book as far as the binding goes as well. Old school leather binding. The book was probably in some library once and was at some point discharged.